MDSI has implemented an open face, dry filter industrial cross draft paint booth into our components fabrication line. This is primarily used to prime the steel structures typically required by many of the entry elements we manufacture in house. Our booth is fabricated from l8-gauge, G-90 galvanized steel sheets and reinforced with heavy duty structural steel I-beams. 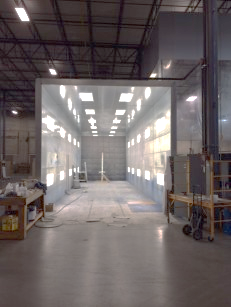 The paint booth is 15’4” wide x 14’8” high and 54’2” deep, so we can accommodate considerably large objects and streamline our manufacturing process. 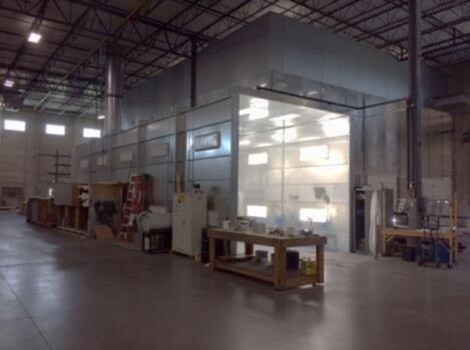 MDSI’s paint booth was designed and constructed to conform to all OSHA and NFPA regulations.